Conclusion: A superb series that presents a lot of new information to the WWII Luftwaffe enthusiast. 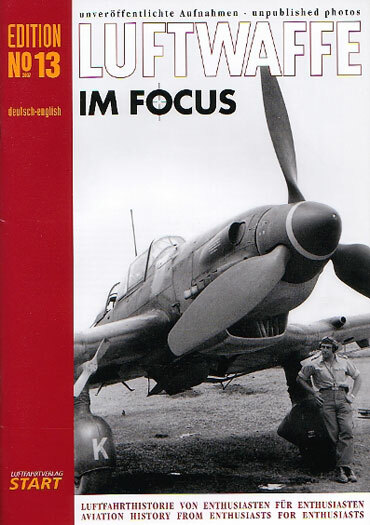 Issues 13 and 14 of Luftwaffe Im Focus are now available. Like their predecessors, they are packed with a smorgasbord of information. This series devotes itself to presenting regular features on a variety of subjects. There are chapters on individual pilots, personal emblems, captured aircraft and tail art. Creating a story from photos is another popular topic and of course there is the obligatory inclusion of fighter, bomber and reconnaissance aircraft. The A4 format is perfect for this type of publication as it allows each photograph to be shown to maximum advantage. The images are further enhanced by the quality of stock they are printed on with many taking up a full half page. Both black and white, and colour period shots can be found with the latter being presented in their own section. About 60 photos average each issue and these are contained on 48 pages between soft card covers. Some lovely pieces artwork compliments the text and these come courtesy of a number of contributors. Ronny Bar, Juanita Franzi, and Herbert Kruse all showcase their talent here. The editions are bilingual with the pages being divided up into both German and English. Uffz. Peter Reinhardt’s Bf 109 G-1 “Black 16” of I/JG 1. Ju 88 C-6 with FuG 202 “Lichtenstein” in Sicily. Bf 110 C-4 with an Mk 101 cannon in a ventral pod. Tails: LG 1 “Ship Killer” markings. Personal emblems: “Animal” paintings on Fw 58s of Air Fleet 6’s Harassment bomber Gruppe. Tails: Balloon Busters of 2.(F)/Ob.d.L. 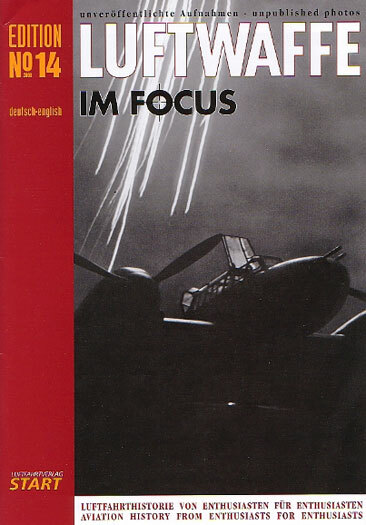 Aircraft in focus: The Adjutant’s wildly “camouflaged” Hs 123 of 3./Fliegergruppe 50. The Luftwaffe of WWII will always be an absorbing topic. With the amount of research being done in Germany it’s good to see a publication like this bring it to a wider audience. The varied nature of the material presented makes for fascinating reading and the quality of the artwork is just icing on the cake.